Seems this thread is not only about the morality of the utilization of flesh, but also about our proclivity to cast words as bait....in hopes of "reeling in" individuals into conflicts. Would that make a case for 'castibaitors'...? I used to work on a 'worm farm' some years ago. If anyone remembers the 'scare' that 'MickeyDs' was using them in their burgers.., forget it. I'm talkin' over 30 years ago..and 'harvested' worms were costing over $3/lb. Chicken was like 50 cents. I learned some interesting things. Some I won't share with you. They have 5 hearts. Not chambers..., but individual hearts. Nobody seems to get the jackass for a totem.., maybe that's it. Most gotta have big ol' bears or wolfies or even wise ol' owls for their own toties. 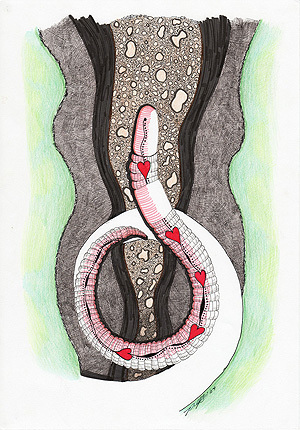 But I did not know that the earthworm is a totem animal as well... http://moonvoice.livejournal.com/412060.html this is a really interesting little read..., I recommend it. Mebbe I have stumbled upon my totem animal after all. 'Moonz the Mearthworm'. Hahahaha.., it fits because some know that I have 'Mirthlyn' as another 'alter ego'. Alter egos are cool. They can even be 'altered' enough in such a way as to alter the other ego that opts for their 'altar' ego. It could be said.., that 'altered' egos alter egos. Sighhhhhhhhhhh ber space. Is it really virtually a virtueless reality...or just sometimes 'slurreal'....? how's tha heart's...?...rated...by consensus view...?...or trust IN self, fOUR health...? Beliefs and their effect on Reality, IE health etc. Something good has come from the media coverage about the tainted meat and slaughterhuose abuses of animals. School lunch lines across the country are filled with greasy, high-fat cheeseburgers, chicken wings, and pizza. But this past March, PCRM helped Broward County, Fla.—the sixth-largest school district in the country—introduce Gardenburger’s Flame Grilled vegan burger to students at Everglades High School, Driftwood Middle School, and Eagle Point Elementary. The veggie initiative began with Ashley Capps, a 10th grade student at Everglades High School who wanted more vegetarian options in the lunchroom. To persuade administrators that students would buy meatless meals, she circulated a petition that was signed by more than 100 of her classmates. PCRM worked with Broward County to explore vegan lunch options that are healthy and taste good. PCRM nutritionists suggested the Gardenburger, and at the request of a Broward County school board member, PCRM helped the district’s food service department roll out the new veggie burger. PCRM president Neal Barnard, M.D., visited each school to speak to parents and administrators about the healthfulness of vegetarian options. Three PCRM staff members traveled to Florida to assist with the marketing and taste-testing of the burgers. They gave out more than 3,400 samples of meatless patties topped with ketchup, mustard, and pickles. Students were so excited about trying the new lunch item that PCRM staffers could barely keep their sample trays full. Many supportive teaches also tried samples and agreed to hand out flyers to encourage their students to buy the burger. Everglades High School, where students have a large food court with 12 choices, sold 100 veggie burgers, and 70 additional students bought lunch that day. The school was so pleased with these results that they sold the Gardenburger every day during March. Driftwood Middle School sold a remarkable 700 veggie burgers. And Eagle Point Elementary, where the veggie burger was competing with a student favorite—cheese pizza—sold about 580 burgers, and 190 more students purchased meals than on a typical day. Each Gardenburger has 90 calories, 11 grams of protein, 4 grams of fiber, zero cholesterol, and only 4 grams of fat. Broward County is also planning to offer Garden Chili, rice and beans, and other vegetarian options. If students continue to purchase the veggie burgers, administrators will roll out vegan options to the entire district in the fall. A vendor arranges vegetables at a wholesale market in the northeastern Indian city of Siliguri February 28, 2008. A gluten-free vegan diet full of nuts, sunflower seeds, fruit and vegetables appears to offer protection against heart attacks and strokes for people with rheumatoid arthritis, Swedish researchers said on Tuesday. CHICAGO - A large study offers the strongest evidence yet that a diet the government recommends for lowering blood pressure can save people from heart attack and stroke. Researchers followed more than 88,000 healthy women for almost 25 years. They examined their food choices and looked at how many had heart attacks and strokes. Those who fared best had eating habits similar to those recommended by the government to stop high blood pressure. The plan, called the DASH diet, favors fruits, vegetables, whole grains, low-fat milk and plant-based protein over meat. Women with those eating habits were 24 percent less likely to have a heart attack and 18 percent less likely to have a stroke than women with more typical American diets. Those are meaningful reductions since these diseases are so common. About two in five U.S. women at age 50 will eventually develop cardiovascular disease, which includes heart attacks and strokes. Women in the study were in their mid-30s to late 50s when the research began in 1980. Previous research has shown this kind of diet can help prevent high blood pressure and cholesterol, which both can lead to heart attacks. The new study appears in Monday's Archives of Internal Medicine. People might think, "I don't have high blood pressure, so I don't have to follow it," said Simmons College researcher Teresa Fung, the study's lead author. However, the results suggest, she said, that "even healthy people should get on it." About 15,000 women in the study had diets that closely resembled the low blood pressure diet. They ate about twice as many fruits, vegetables and grains as the estimated 18,000 women whose diets more closely resembled typical American eating habits. Although the study only followed women, Fung said men would probably get similar benefits from the approach. The study was limited because it merely tracked the women and their habits for 24 years. That's a less rigorous method than randomly assigning equal groups of women different diets and comparing results. But that would be extremely difficult to do for such a long time. Given that limitation, Dr. Laura Svetkey, director of Duke University's hypertension center, said the study provides the best evidence yet of important long-term benefits from a low blood pressure diet. "It's nice to see research that really is aimed at helping people with prevention in a very practical way," Svetkey said. She noted that the DASH diet, which stands for Dietary Approaches to Stop Hypertension, is available free on the National Institutes of Health Web site. The study was funded with NIH grants. Dr. Nieca Goldberg, medical director of New York University's Women's Heart Program, said many patients would rather take a pill than adjust their eating habits. But, Goldberg said, "I always point out to my patients, if you make these changes in your lives, it could ... keep you off medication" in the long run. "There has to be a greater emphasis on the way we live our lives," she said. Hau ! Starblood and Betta. Thank you for writing to me. I am Oitancan Zephier, a former police officer of the Yankton Sioux Tribe, combat veteran of Afghanistan and a father. Last week I quit my job when the protests started over the building of a hogfarm by a corporation on private land surrounded by tribal lands. I quit because the Bureau of Indian Affairs will not help us. They stand and watch us get tossed in jail.The filth of the pigs will effect every part of our indian people here. There is a headstart school 2 miles away from the hog farm. There is a kindergarten through 12th grade school 4 miles away. There is a day care a couple miles away from the site. It is a prejudice act granted by the state of South Dakota to these pigfarm owners. We need your help. If this is completed they will assume jurisdiction of all that surrounds them. The already began taking our tribal road, which we have intensely fought for 2 weeks now. And I have been thrown in jail and that is wrong ! People! We need your help! Come to Marty, SD now! Help us fight the Longview Farms Hogfarm and the State of South Dakota. We need the help of every nation that is willing to help us! Don't wait for an invitation. Please! Come help us now! We're too busy with things here to think of everyone that can help us. We have our hands full with what's in front of us. Call us. Make suggestions. Give us advise! Whatever it is, help us! We need bodies. We need people!! people! We need people willing to fight! We need people willing to go to jail by a state officer on Indian land! Doesn't that seem wrong to you? I went to jail while standing on a tribal highway by a South Dakota state deputy, while the Bureau of Indian Affairs watched. That's what is happening! It is wrong! We need money for bail. Many more of our Indian people will be going to jail. If we don't fight this, Indian people will continue to lose land. Next time it will be your people. Remember when a cry for help came out what 'reason' or 'excuse' you gave. You'll get it right back when you need help. The system keeps us locked in place. It keeps us working, paying bills and plugged into society. In that mindset we're all robots programmed to do what the government wants us to do pay taxes! Give them money! 'I gotta feed my family,' you're thinking. I know it. I was too but overcame it. I never met a NAm vegan...lol...I think these concerns are more superficial...hog farms don't HAVE to be stinking places...certainly we can't regulate how someone uses the land that they own...but regulations could be enacted to restrict how this will effect the surrounding communities...even junk yards have to have big fences because they offend the eye...and Paper mills have strict regulations because of the way they stink up the surrounding area... surly this potential problem can be solved by the community. even more plans to force themselves on others is the big corps that want to control water... here is a real eye opener... http://uk.youtube.com/watch?v=yVoEN__ry ... t_locale=1, and a real reason to become active in your communities future. I will be posting here a series of articles on Vegan Health. This diet is similar to what James told me he follows. BENNINGTON — Tim VanOrden will do whatever it takes today to get his body to the top of a 62-story skyscraper in downtown Los Angeles before hundreds of others. But unlike his competitors, he is only fueled by fruits and vegetables, some nuts and some seeds, and he eats them only in their natural state: uncooked, unprocessed and unrefined. He is a raw vegan athlete and has been for the past three years. That is when a mysterious illness caused him to quit his job and try something entirely new. That is when he started running up mountains, then buildings, now in snowshoes and on the track. Since then, he has sold off many of his personal possessions to finance his new passion, training more than 70 miles a week, often up mountains, and eating what he believes is the healthiest diet out there. He is not selling anything, other than a lifestyle. He has created a Web site. He is working on a book and a documentary. He is trying to reach as many people as possible. "I've done a lot of things in my life," VanOrden said recently at his parents' home in Bennington where he is staying, "and this just feels right to me. It's become a mission because it's made such a drastic difference, such a huge improvement in my life that I want other people to have access to it. "I'm not telling people they have to do it, but I'm trying to set an example so maybe they'll choose to do it on their own," he said. Although he is nearly 40, VanOrden looks much younger. His short brown hair shows no signs of gray or thinning. His slim, 5-foot-9-inch, 151-pound build is taut. He is California brown. Veins can be seen on his forearms and calves. It appears as though he is always flexing, even when he is relaxing and making a smoothie in his parents' kitchen after a morning 8-mile run on the trails behind the old colonial farmhouse near the Woodford border. The smoothie is the staple of VanOrden's post-run diet. It starts out fairly typical, with a banana, some blueberries. But then seaweed is added, and hemp seeds and then unpasteurized honey. Finally, cabbage kale is added and some Vermont well water for extra minerals. The blending of the unfamiliar ingredients is the only processing VanOrden's food ever receives. The Aon Center in Los Angeles has 1,377 individual stairs. This is what VanOrden's challenge is when he races today. On a Stairmaster last week, he set a personal record climbing the equivalent of 80 floors, approximately 1,777 steps, in 7 minutes 55 seconds. He is hoping for similar success. Although he is considered one of the top three tower racers in the nation, he will have to push his body to its absolute limit to win. From the gun, he will go as fast as he can. He knows this will be a bad idea but he cannot say no to his adrenaline. It is the same story every time, no matter if it is the Sears Tower (103 floors) in Chicago or the Empire State Building (102 floors) in New York. First, his quads will fail, then his gluteus. To compensate, he will pull on the railings until his arms turn to jelly, and then, it is back to the quads. It is always the same feeling. "It's like you've been hit by a truck, been beaten with lead pipes, had a blow torch put down your throat and then somebody tears your arms out of their sockets," he said with a sinister laugh. It is not just the physical challenge but also the stairwell air quality that adds to the misery. After all, who uses the stairs in a city skyscraper when the elevator is always just the push of a button away? "The air is so dusty and dry it literally scorches your trachea to the point where it feels like you're going to die," VanOrden said wearing his self-designed, dry-fit shirt, with the name of his Web site, RunningRaw.com, printed on the front, and his slogan, Powered by Raw Foods, on the back. "You can't breath. Everyone who finishes the race is gasping and holding their throat, and they're screaming and moaning because it hurts so bad." VanOrden said this feeling lasts for days, but, yet, he keeps getting drawn back. He races nearly every weekend, often up towers, fully knowing the pain that awaits. "I don't do it because I like it," he said, again grinning with delight. "I don't do it because it's fun, cause it's not. I can't imagine a more painful, brutal experience. I mean you're literally torturing yourself, it's kind of like masochism. I do it because I'm good at it." VanOrden's running journey started on the Paseo Miramar trail in Pacific Palisades, Calif., known for its steep climbs and scenic vistas. He had been working in Los Angeles as an actor and photographer, adhering to a vegan diet on the advice of a woman who told him that all the movie stars ate that way to stay young looking. However healthy his diet was — he ate that way for six years — the stress of living in Los Angeles finally caught up to him. Eventually, he could not get out of bed. Paralyzed by extreme fatigue, he quit his job. VanOrden had met people who called themselves "raw foodists," but he never thought anything of it. Now, although skeptical, he was at the point where he was willing to try anything to get better. "At first, I thought why would I want to do that?" he said. "That's stupid, and what do you eat? Bird seed and wheat grass and carrot juice." But instantly after eating raw foods, he felt better, and after six months, he told himself that he was going to eat this way the rest of his life. His family and friends were supportive. "When I went vegan, they all thought I was crazy," he said. "It's like, 'Oh no, he's in California now, he's like one of those freaks,'... But when I went raw that didn't happen because they really saw a dramatic difference in me." VanOrden also relies on his parents for financial support. His blog fell silent once after he had to sell his laptop to pay for his trip back home after a race. Every time he looks at his old photography equipment, he thinks about its price; maybe one day he will have to sell it for rent or food money. His financial situation makes him uncomfortable, but his supporters, his fans, have told him to keep going, to keep spreading the word about the benefits of a raw diet and exercise. So that is what he will do, although never forcefully. "I'm not trying to tell people that you have to do this," he said, "or if you eat meat or fried food, you're wrong. I don't want to say that because I don't believe that, but I do feel if people were to eat more fruits and vegetables, not even worry about becoming a raw vegan, they would see huge differences in their lives, in their fitness, weight and body shape." VanOrden has credited his diet with making his sports-induced asthma disappear. He believes it has caused his hair to grow back and kept his skin wrinkle free. He also recounted stories where he believes the diet has cured diabetes and made a brain tumor vanish. VanOrden was a runner at Mount Anthony Union High School and briefly in college, but 17 years had passed between the last time he ran competitively and when he started his new, raw diet. Two months in, at age 37, he felt like he had the energy of an 18-year-old and decided to go for a run. "I thought, you know what, I haven't run in a long, long time," he said. "That's something I really miss in my life. I want to see if this energy translates into athletic ability." He soon entered a half marathon on Catalina Island off the coast of California and finished fourth. His experiment now became a mission, a life's work. "It's 100 percent of my life," he said. "I'm not doing this to get famous or rich. I just believe in it. I finally feel like my life has a purpose." VanOrden has been training like a man possessed, but he still only consumes about 1,500 to 2,000 daily calories, less than most inactive men at his weight. It is hard for him to eat more. The 2-pound salad he will have for dinner will only give him about 300 calories. His theory is that his diet has eliminated a large percentage of his caloric need, as he does not require the caloric energy most people do to break down processed and fatty foods. On this limited fuel, VanOrden was hoping to qualify for the U.S. Olympic Trials in the 10-kilometer, but he realizes this goal is quickly slipping away. He has yet to break 30 minutes in the event, with 28 minutes 15 seconds the qualifying mark and the trials fast approaching. He also knows his new goal will be tough, and most running aficionados would probably tell him he has no chance. He wants to be the first 40 year old to run a sub-4 minute mile. He ran a 4:35 mile last summer. His 40th birthday is next week. Whether he comes close to reaching his goal or not, his journey will probably go on. He runs for himself, there is no doubt about that, but he also runs to inspire others. On his blog, he occasionally questions the path he is taking, but so far, he has always awoken the next day, full of energy, and laced up his running shoes to test his physical limits. "It's difficult to know how much of an impact I'm having on this journey," he wrote in January. "I often wonder if people just think I'm crazy, especially when I turn down the free doughnuts, homemade chili, hot chocolate and stacks of pancakes that usually follow these races. I do wish you would post "what James told you he follows" as you have mentioned it several times, as if he has some specific diet which he follows...which I do not believe is the case. You have posted other personal e mails, so it does raise some concerns when you keep referring to something he may have said in passing that you are blowing out of proportion...since he has said in past communications, and even in the latest interview, that he does not prescribe any specific techniques...for others...and encourages them to adapt even the ones suggested in the materials to our own preferences. I think James would be disappointed if he discovered that you were suggesting we all become vegans, because he was...if, in fact, he is (which I seriously doubt) ... I have no problem with you posting diets...but I do have a problem with you speaking FOR James or using him to endorse your personal belief system without documentation or his expressed permission to do so. What I am referring to is a q & A session that was posted back to us on one of the old Forums I printed out a copy. I submitted the question "James, are you a vegetarian"? His answer was/is that he eats mostly fruits, vegetables, nuts and grains. If you know what he said you had no need to ask. you were fishing for and argument to feed on. However, I pursued that and found that (like myself at the time) he eats it only when there is nothing else available for nutritional balance. I am not and do not espouse being a militant vegan. Why do you have this need to argue so. It has the lower vibration. I think the fact that this question and its answer no long appear in the website, speaks for itself...and makes it clear that what James does or doesn't eat, or any of his other personal habits has nothing to do with the WMMs or being "spiritual" ... as he said in the interview, (which I am paraphrasing) a person's lifestyle doesn't really matter...so you might ask yourself why you feel so impressed to push yours on others and claim (over and over again) James' endorsement of any particular diet when he has never done such a thing? as for "argumentive", that is how you perceive it...I am contributing to a discussion about diets ...nothing more nothing less...it wouldn't matter who posted this type of tripe, I would reply in the same manner and state my own perspective of what was being discussed, A Vegan diet, which I have, from my own personal experience, found lacks nutritional wholeness and just makes life more difficult (and expensive) than is necessary. I am sorry that you can not respect my Sovereign right to state my opinion without seeing it as a personal attack...it really has nothing to do with your preferred lifestyle, as any discerning individual could easily understand. "don't feed pearls to swine." but can i feed you come buffalo soup? Q: Do you consider yourself "spiritual?" A:I don't think I'm spiritual enough. I mean I'm not sensitive like the spiritual people. How can I be spiritual if I don't have any food allergies? I'm good with gluten, I tolerate lactose..I do! I digest dairy. How can I be spiritual if I partake of the cow? When I meditate, I don't "OOM", I "MOO." I thought you could appreciate this coulterIV like I do. Vanda is a stand up comedian I have the fortune to know and she is very funny. You can check out her website if interested. Vanda Mikoloski is a renowned stand-up comic and speaker whose passion is personal growth and development. Vanda's work is a delightful, irreverent romp down her twisted spiritual path. The concept "enlightenment" is fascinating to her. Vanda's stand-up comedy deals with the human predicament, inquiring into the nature of being a human being, the trap of it all and the absurdity of it all. She offers powerful spiritual distinctions in a ridiculously funny way that leave the audience *empowered, inspired and transformed. She begins by questioning our point of view about our point of view and then challenges many of our spiritual beliefs and beliefs about reality. Many people have reported **profound shifts after experiencing Vanda's stand-up work. *** sad - sick and sad . . . .
May you GET what you give (to the cow). Opps! I said it again! Interesting note. In the background of Vanda's performance video is the wooden wing symbol of Unity Church. Despite the common belief that drinking milk or eating eggs does not kill animals, commercially-raised dairy cows and egg-laying chickens, whether factory-farmed or 'free range,' are slaughtered when their production rates decline. Learn more. Animal agriculture takes a devastating toll on the earth. It is an inefficient way of producing food, since feed for farm animals requires land, water, fertilizer, and other resources that could otherwise have been used directly for producing human food. Learn more. The consumption of animal fats and proteins has been linked to heart disease, colon and lung cancer, osteoporosis, diabetes, kidney disease, hypertension, obesity, and a number of other debilitating conditions. Cows' milk contains ideal amounts of fat and protein for young calves, but far too much for humans. Learn more. Latest News On Pork Production. With corporate hog factories replacing traditional hog farms, pigs raised for food are being treated more as inanimate tools of production than as living, feeling animals. Approximately 100 million pigs are raised and slaughtered in the U.S. every year. As babies, they are subjected to painful mutilations without anesthesia or pain relievers. Their tails are cut off to minimize tail biting, an aberrant behavior that occurs when these highly-intelligent animals are kept in deprived factory farm environments. In addition, notches are taken out of the piglets' ears for identification. By two to three weeks of age, 15% of the piglets will have died. Those who survive are taken away from their mothers and crowded into pens with metal bars and concrete floors. A headline from National Hog Farmer magazine advises, "Crowding Pigs Pays...", and this is exemplified by the intense overcrowding in every stage of hog confinement systems. Pigs will live this way, packed into giant, warehouse-like sheds, until they reach a slaughter weight of 250 pounds at 6 months old. The air in hog factories is laden with dust, dander, and noxious gases, which are produced as the animals' urine and feces builds up inside the sheds. Studies of workers in swine confinement buildings have found sixty percent to have breathing problems, despite their spending only a few hours a day inside confinement buildings. For pigs, who spend their entire lives in factory farm confinement, respiratory disease is rampant. Porcine Reproductive and Respiratory Syndrome, or PRRS, was first reported in U.S. herds in 1987. It is now estimated to be in as many as 60 percent of U.S. herds...Swine arthritis has increased in economic importance with confinement rearing, partly because of damage related to flooring conditions and partly because of faster growth rates and lack of exercise...The incidence of salmonellosis has continued to increase. It is estimated that one-third to half of farms have some level of salmonellosis...Epidemic transmissible gastroenteritis, or TGE, is a dreaded disease because it's hard to keep out of herds, there's no effective treatment and it carries a devastating mortality rate in baby pigs. Nearly all pigs less than 10 days old die if infected...Forty to 70 percent of U.S. pigs show evidence of infection with bratislava (a type of Leptospirosis)...Tests indicate 80 percent to 85 percent of sows in major swine producing areas have been exposed to parvovirus. Modern breeding sows are treated like piglet-making machines. Living a continuous cycle of impregnation and birth, each sow has more than 20 piglets per year. After being impregnated, the sows are confined in gestation crates — small metal pens just two feet wide that prevent sows from turning around or even lying down comfortably. At the end of their four-month pregnancies, they are transferred to similarly cramped farrowing crates to give birth. With barely enough room to stand up and lie down and no straw or other type of bedding to speak of, many suffer from sores on their shoulders and knees. When asked about this, one pork industry representative wrote, "...straw is very expensive and there certainly would not be a supply of straw in the country to supply all the farrowing pens in the U.S."
Numerous research studies conducted over the last 25 years have pointed to physical and psychological maladies experienced by sows in confinement. The unnatural flooring and lack of exercise causes obesity and crippling leg disorders, while the deprived environment produces neurotic coping behaviors such as repetitive bar biting and sham chewing (chewing nothing). After the sows give birth and nurse their young for two to three weeks, the piglets are taken away to be fattened, and the sows are re-impregnated. An article in Successful Farming explains, "Any sow that is not gestating, lactating or within seven days post weaning is non-active," and hog factories strive to keep their sows '100 % active' in order to maximize profits. When the sow is no longer deemed a productive breeder, she is sent to slaughter. The overcrowding and confinement is unnatural and stress-producing since pigs are actually very clean animals. If they are given sufficient space, pigs are careful not to soil the areas where they sleep or eat. But in factory farms, they are forced to live in their own feces, urine, vomit and even amid the corpses of other pigs. Death losses during transport are too high — amounting to more than $8 million per year. But it doesn't take a lot of imagination to figure out why we load as many hogs on a truck as we do. It's cheaper. So it becomes a moral issue. Is it right to overload a truck and save $.25 per head in the process, while the overcrowding contributes to the deaths of 80,000 hogs each year? Prior to being hung upside down by their back legs and bled to death at the slaughterhouse, pigs are supposed to be 'stunned' and rendered unconscious, in accordance with the federal Humane Slaughter Act. However, stunning at slaughterhouses is terribly imprecise, and often conscious animals are hung upside down, kicking and struggling, while a slaughterhouse worker tries to 'stick' them in the neck with a knife. If the worker is unsuccessful, the pig will be carried to the next station on the slaughterhouse assembly line — the scalding tank — where he/she will be boiled, alive and fully conscious. Since the 1980s a series of mergers and acquisitions has resulted in concentrating over 80% of the 35 million beef cattle slaughtered annually in the U.S. into the hands of four huge corporations. Many beef cattle are born and live on the range, foraging and fending for themselves for months or even years. They are not adequately protected against inclement weather, and they may die of dehydration or freeze to death. Injured, ill, or otherwise ailing animals do not receive necessary veterinary attention. One common malady afflicting beef cattle is called "cancer eye." Left untreated, the cancer eats away at the animal's eye and face, eventually producing a crater in the side of the animal's head. Accustomed to roaming unimpeded and unconstrained, range cattle are frightened and confused when humans come to round them up. Terrified animals are often injured, some so severely that they become "downed" (unable to walk or even stand). These downed animals commonly suffer for days without receiving food, water or veterinary care, and many die of neglect. Others are dragged, beaten, and pushed with tractors on their way to slaughter. Many cattle will experience additional transportation and handling stress at stockyards and auctions, where they are goaded through a series of walkways and holding pens and sold to the highest bidder. From the auction, older cattle may be taken directly to slaughter, or they may be taken to a feedlot. Younger animals and breeding-age cows may go back to the range. Ranchers still identify cattle the same way they have since pioneer days — with hot iron brands. Needless to say, this practice is extremely traumatic and painful, and the animals bellow loudly as ranchers' brands are burned into their skin. Beef cattle are also subjected to 'waddling,' another type of identification marking. This painful procedure entails cutting chunks out of the hide that hangs under the animals' necks. Waddling marks are supposed to be large enough so that ranchers can identify their cattle from a distance. Most beef cattle spend the last few months of their lives at feedlots, crowded by the thousands into dusty, manure-laden holding pens. The air is thick with harmful bacteria and particulate matter, and the animals are at a constant risk for respiratory disease. Feedlot cattle are routinely implanted with growth-promoting hormones, and they are fed unnaturally rich diets designed to fatten them quickly and profitably. Because cattle are biologically suited to eat a grass-based, high fiber diet, their concentrated feedlot rations contribute to metabolic disorders. Cattle may be transported several times during their lifetimes, and they may travel hundreds or even thousands of miles during a single trip. Long journeys are very stressful and contribute to disease and even death. The Drover's Journal reports, "Shipping fever costs livestock producers as much as $1 billion a year." Young cattle are commonly taken to areas with cheap grazing land, to take advantage of this inexpensive feed source. Upon reaching maturity, they are trucked to a feedlot to be fattened and readied for slaughter. Eventually, all of them will end up at the slaughterhouse. A standard beef slaughterhouse kills 250 cattle every hour. The high speed of the assembly line makes it increasingly difficult to treat animals with any semblance of humaneness. A Meat & Poultry article states, "Good handling is extremely difficult if equipment is 'maxed out' all the time. It is impossible to have a good attitude toward cattle if employees have to constantly overexert themselves, and thus transfer all that stress right down to the animals, just to keep up with the line." Prior to being hung up by their back legs and bled to death, cattle are supposed to be rendered unconscious, as stipulated by the federal Humane Slaughter Act. This 'stunning' is usually done by a mechanical blow to the head. However, the procedure is terribly imprecise, and inadequate stunning is inevitable. As a result, conscious animals are often hung upside down, kicking and struggling, while a slaughterhouse worker makes another attempt to render them unconscious. Eventually, the animals will be "stuck" in the throat with a knife, and blood will gush from their bodies whether or not they are unconscious. The cattle were supposed to be dead before they got to Moreno. But too often they weren't. "In plants all over the United States, this happens on a daily basis," said Lester Friedlander, a veterinarian and formerly chief government inspector at a Pennsylvania hamburger plant. "I've seen it happen. And I've talked to other veterinarians. They feel it's out of control." The U.S. Department of Agriculture oversees the treatment of animals in meat plants, but enforcement of the law varies dramatically. While a few plants have been forced to halt production for a few hours because of alleged animal cruelty, such sanctions are rare. Reaction to the Washington Post investigative piece and others like it precipitated a Congressional resolution reiterating the importance of the Humane Slaughter Act, but to date, there is little if any indication that the situation for animals in slaughterhouses has appreciably improved. Interesting! The vegan "beef au ju" dinner has more protein that animal flesh! Better watch out for them soya beans, they can be nasty little critters. I've been eating raw vegan since returning "home", about 3 weeks ago. I have found absolutely no negative effects, only benefits. Among the incredible sense of well being and aliveness, there is wonderful energy, decreased craving for food, increased sensitivity to all of the 6 senses, no fatigue or heaviness feeling after even a large meal, more restful sleep, the skin is bright, the body is light, the mind is clear and sharp. Eating raw is eating living foods. I wont say eating raw is integral for spiritual practice or development, but I will say it is an incredible support, and discipline. It feels very natural, and simple. Look in nature, do any other animals cook their food before eating it? Also look in nature at the types of minds that specific diets support; imagine a lion's mind, thoughts, emotions, feelings, and physical actions. Imagine an elephant or horse's diet, their mind, thoughts, emotions, feelings, and physical actions. There is no right or wrong answer here, it's our own exploration to find the right balance and harmony with our entire being. Another thought just arose, consider Monks, they go out for alms and accept any type of food that is freely offered. They dont have preference for vegetable or meat, for sour or sweet. Whatever is freely offered, they depend on the universe to provide sustenence for the body. Their practice is that equanimity towards all conditions. That too can be a powerful discipline and support. Interesting. Thanks. I've been thinking about trying the raw diet. I DID do a form of that many years ago and remember the feelings you are describing. I hope you'll keep posting about that. Do you have any receipes?